A good opportunity to realize your own intentions. 8-) Writing for your academic thesis actually starts when planning, reading and experimenting. The 5th “Kleine Nacht des wissenschaftlichen Schreibens an der TUHH” (Short Night of Academic Writing at TUHH), taking place in the rooms around Audimax 1 (Building H – Am Schwarzenberg Campus 5) on Wednesday April 11, 2018 from 3 pm to 10 pm, offers an opportunity to get stimulation and animation around academic writing and research methods as well as to practice writing at once. 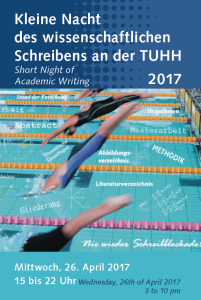 The 4th “Kleine Nacht des wissenschaftlichen Schreibens an der TUHH” (Short Night of Academic Writing at TUHH), taking place in the rooms around Audimax 1 (Building H – Am Schwarzenberg Campus 5) on Wednesday April 26, 2017 from 3 pm to 10 pm, offers an opportunity to get stimulation and animation around academic writing and research methods for students and lecturers as well as to practice writing at once. A “Round table for questions by international students (also in english language)” is offered by Bertrand Schütz, 7.00 pm – 7.45 pm, in room H0.08. The “Kleine Nacht” is organized by the TUHH Student Counseling Center in cooperation with the students’ union executive committee AStA, the TUHH library, the Center for Teaching and Learning (ZLL), University Sports, and the TU Computing Centre as well as several internal and external contributors. 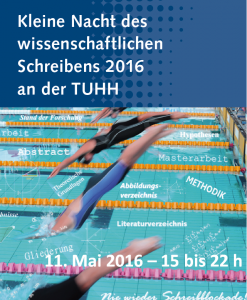 The third “Kleine Nacht des wissenschaftlichen Schreibens” (Little or Short Night of Academic Writing) will take place at TUHH in the rooms around Audimax 1 (Building H – Am Schwarzenberg Campus 5) on Wednesday May 11, 2016 from 3 pm to 10 pm. The “Kleine Nacht” include stimulation and animation around academic writing and research methods for students and lecturers. This year the first time also with a program of introductory presentations in English! Concentrated and silent active work is possible in special writing rooms. The program (flyer) includes motivational talks (this year the first time also in English!) as well as workshops. Writing consultation is offered as well as consultation on scholarly research methods, on finding subject information and on knowledge organisation through reference management! Consultation is also possible in English language! 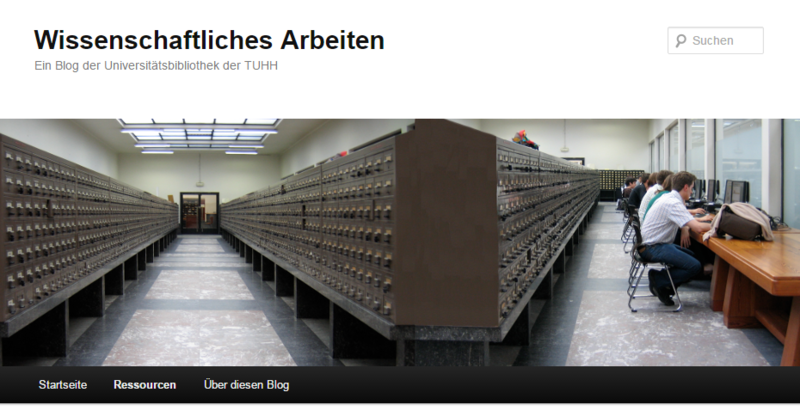 The TUHH library has been offering a German language weblog since a few years, which accompanies a seminar course “Academic research and writing” (Description in English) as a form of showcase. Some of the lecturers from this course, which is organised by the TUHH library and which is part of the module “Nontechnical Complementary Courses for Bachelors” at TUHH, will offer some of the introductory presentations at the “Kleine Nacht”. 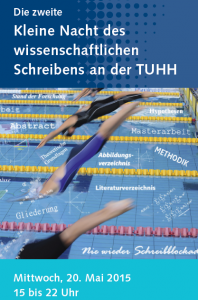 The second “Kleine Nacht des wissenschaftlichen Schreibens” (Little or Short Night of academic writing) will take place at TUHH in the rooms around Audimax 1 (H – Am Schwarzenberg Campus 5) on Wednesday May 20, 2015 from 3 pm to 10 pm. The “Kleine Nacht” include stimulation and animation around academic writing and research methods for students and lecturers. Application for the “Kleine Nacht” is possible through the learning management system Stud.IP. But you are also welcome without registration. Concentrated and silent active work is possible in special writing rooms. The program (flyer) includes motivational talks (in German language only!) as well as workshops. Writing consultation is offered as well as consultation on scholarly research methods, on finding subject information and on knowledge organisation through reference management! Consultation is also possible in English language! The first “Kleine Nacht des wissenschaftlichen Schreibens” (Little or Short Night of academic writing) will take place at TUHH in the foyer and rooms around Audimax 1 on Wednesday May 7, 2014 from 3 pm to 10 pm. The “Kleine Nacht” include stimulation and animation around academic writing and research methods for students and lecturers. It is organized by the TUHH Student Counseling Center in cooperation with the students’ union executive committee AStA, the TUHH library, the Center for Teaching and Learning (ZLL), University Sports, and the TU Computing Centre as well as several internal and external contributors. Concentrated and silent active work is possible in special writing rooms. The program (flyer with program) includes motivational talks (in German language only!) as well as workshops. Writing consultation is offered as well as consultation on scholarly research methods, on finding subject information and on knowledge organisation through reference management! Consultation is also possible in English language!